The Victoria Golf Club was host to an exceptional ceremony prepared by the executives of the BC council to celebrate the election of Mr Georges Murr as the World Vice president of WLCU. On Sunday morning (March 30, 2014) leaders from Vancouver’s chapter (LCS of BC) and BC Youth boarded a ferry to Vancouver Island to join leaders of Victoria’s chapter (CLCA) for a celebratory lunch to honour the election of one of their own, Mr Georges Murr. Being elected as World Vice President of WLCU is a very prestigious position in an organization associated with the DPI of the United Nations and represents the Lebanese Diaspora. 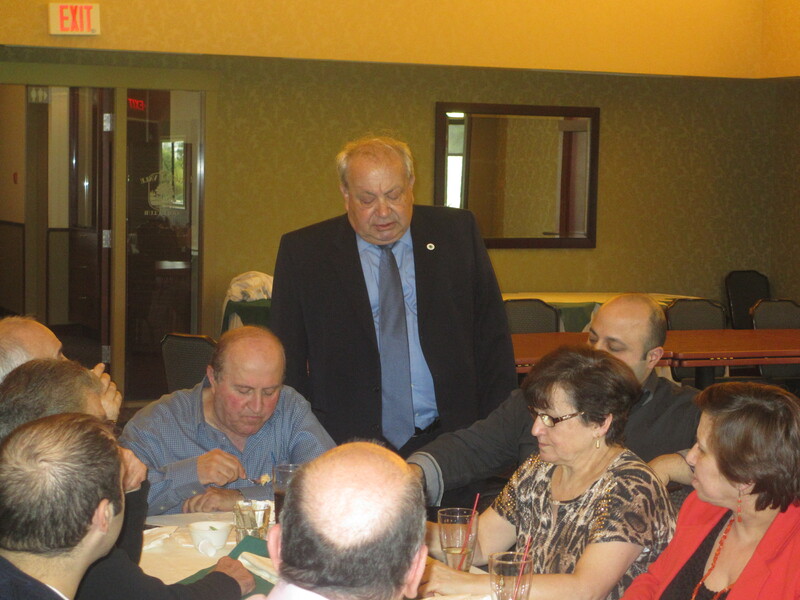 The lunch was attended by the executive members of the WLCU BC council as well as Mr. Murr’s family. CONGRATULATIONS MR GEORGE MURR FOR YOUR ELECTION TO THE OFFICE OF THE VICE -PRESIDENT OF THE WLCU. We are extremely proud and happy to know that you have been elected as World Vice President for THE NORTH AMERICA geographic region We could not agree more that you will fulfill this position to the best of your ability and with your extraordinary quality of leadership and administration, we are confident that you will set things on track. We all know that you are blessed with the gift of gab and we are sure that you will open the eyes of president Kuri and all the leaders of WLCU. Your history of great success, Vice President George, goes way back. It starts at the chapter level at Victoria and again you were very successful when you led WLCU BCC, we were delighted to have worked with you and to continue working with you and supporting you. We won’t forget your achievements when you were the president of WLCU North America Region. Your successes at all levels have paved the road for you to be where you are today. You have initiated the organization and with your excellent leadership skills and guidance, we will carry on in your footsteps and we will make sure that the new leaders at the North America region will make you proud. With your hard work, you have put North America region at the top. We applauded you…Job well done George. We promise we will be on your side, and we know you will be on ours. If we may say, we stood behind you and defended you when you needed us and we are now confident that you will do the same if the need arises. We know and we are sure you will stand up and persuade the newly elected world President and the leaders of the WLCU worldwide and lead them to start a new beginning for a new WLCU. We have great feedback from all our leaders who attended Argentina’s meetings, and the common words they said (was a democratic election) (democratic meeting); that is great. To start a new beginning with the word DEMOCRACY, Vice President George, we congratulate all of the newly elected leaders at Argentina and hope you will let them know that DEMOCRACY is having a democratic constitution and by-laws. Please let our leaders know that DEMOCRACY means having equal rights and practicing them for ALL the Geographic regions. VICE PRESIDENT GEORGE, we confirm that WLCU BCC is the best WLCU council in all WLCU. We wish to advise that next year 2015 -Our LCS of BC will be (50) fifty years old -Victoria club will be (32) years old – WLCU-BCC is Affiliated with WLCU for (20) years. We are very proud of all our leaders in BC for their great accomplishments locally, regionally, and worldwide. Our WLCU BCC is very successful as we have a high skilled team working together in maintaining a high standard and quality WLCU BCC website (WLCU/ULCM.ORG). We would like to congratulate the editors and our technical team for doing a super job on the web. Vice President George we have confidence in you. You will represent us very well at the world level, and we, at WLCU BCC, will make you proud of us as we represent the 3 of our chapters at North America’s level. Vice President George, we the WLCU BCC put WLCU on the top when we became associated with the DPI and accredited with the ECOSOC of the UN. We should be proud of our achievements. Vice President George God bless you and your family and may God bless your success in your business and your new mission. And may God bless The Wounded LEBANON and bless you all…..
Mr. Murr was very touched and thanked John Badr for his kind words and assured all those present of his willingness to work with the new WLCU World President Mr Alejandro Kuri to implement the changes desperately needed in our organization. His goal is to represent the North American region in the decision making process avoiding any political or religious interference. He emphasized that the organization’s goal is to work for all the Lebanese in the diaspora without any religious or political involvement. Furthermore, he stated that our kids who were born outside Lebanon need us to work hard, and in high standard, in order to ensure their involvement with the organization’s activities. They are the future and without them there is no future for the WLCU. Mr Murr is excited for the upcoming event in 2015 that celebrates the 20 years of cooperation and partnership that the Vancouver and Victoria communities have had under the WLCU BC council. He also stated that the Benches project that will honour the late Mr Najib Asfar of Victoria and the late Mr Chawqi Rashed of Vancouver is a clear example of the organization’s values and commitment towards the mission statement and its initiatives in honouring past leaders and working together for a bright future. Mr Murr thanked all attendees as well as the members who organized this event. Past President of BC Council Mr Henry Zarifeh, past WSG Dr Nick kahwaji assured the World Vice President of all their support. LCS president Eng Camille Louis and BC Youth Chairman Eng Marc Ghanem offered their help in any possible way. The ceremony ended with cake cutting and souvenir pictures. Previous article LCS of BC | President’s Message 2014? :Our youth are the guarantee of the future of our Lebanese Canadian Society in BC.